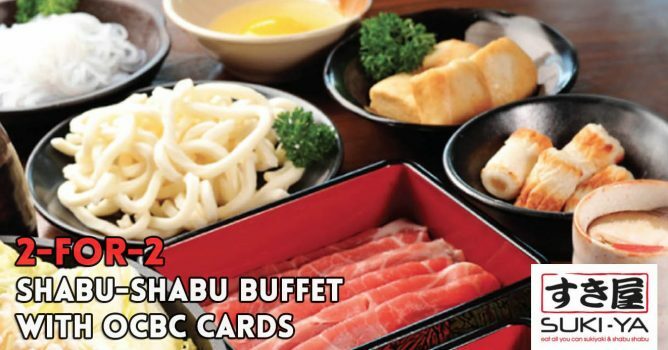 Home > Dining and Gourmet > Suki-Ya: 2-for-2 Shabu-Shabu Buffet (60min) with OCBC Cards! Locations: Click here for full outlets listing. Valid at all outlets except Bugis+ and Plaza Singapura. Validity: Till 30 November 2016, Mondays to Fridays, 11:30am to 3:00pm at Marina Square, Bedok Point and 112 Katong, 11:30am to 4:00pm at all other participating outlets. Valid from Mondays to Fridays, until 31 November 2016. Valid with minimum of 4 diners. Valid at 11:30am to 3:00pm at Marina Square, Bedok Point and 112 Katong, 11:30am to 4:00pm at all other participating outlets. Valid at all outlets except Bugis+ and Plaza Singapura. Valid for Shabu-Shabu buffet dine-in only, not valid for private events. Not valid for premium meat add-ons, drinks and alcoholic beverages. Not valid in conjunction with other discounts, promotions or vouchers. Offer is not exchangeable for cash, kind or other goods and services.